Students of Jadabpur University in India broughtout a procession on Monday protesting crackdown on students demanding safe roads in Bangladesh and killing of their fellows in road accidents. Students of Kolkata city in India on Monday expressed their solidarity with the Bangladeshi students, who have been demonstrating over the "safe road" campaign since July 29. 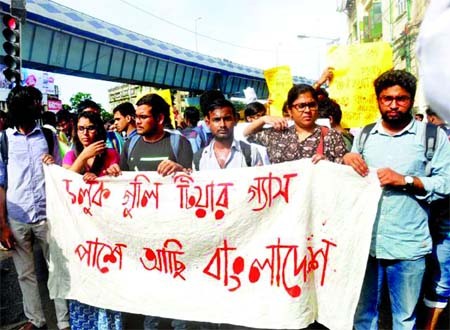 The students of Rabindra Bharati University, Presidency University, Kolkata and different other colleges took to the streets of Kolkata and expressed their solidarity with Bangladeshi protesting students, on Monday afternoon. Students of Jadavpur College, Presidency University, (former Presidency College) and CU college of West Bengal on Monday surrounded the Bangladesh High Commission there with a huge procession. Then, the students of the city brought out a procession and paraded important streets of Kolkata protesting the attack on the students in Bangladesh. On August 4, the capital's Jhigatola area turned into a battlefield when the students were attacked allegedly by BCL men near the main gate of BGB headquarters, leaving scores of students injured. Student's protests are continuing for the ninth consecutive day on Monday, demanding road safety across the country. Protesting students also demanded exemplary punishment of the responsible persons over the death of two students who lost their lives in a road crash in capital's Kurmitola area. Earlier on July 29, two students of Shaheed Ramiz Uddin Cantonment School and College, Diya Khanam Mim and Abdul Karim Rajib were killed and several received injuries on Airport Road as a Jabal-e-Noor bus ploughed through a crowd while competing with another bus of the same company.